Pre- and Post-Storm Lidar Topography: Comparisons of beach elevations measured before and after the storm quantify magnitudes of coastal change resulting from Hurricane Sandy. Pre and Post Storm Photo Comparisons: Before and after photo pairs show examples of coastal change resulting from Hurricane Sandy. Pre and Post Storm Photos: Photography of the coast from North Carolina to Massachusetts. View photos. 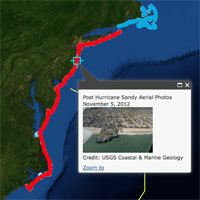 Predicted Coastal Change Impacts: See predicted likelihood of coastal change along the Mid-Atlantic coast. 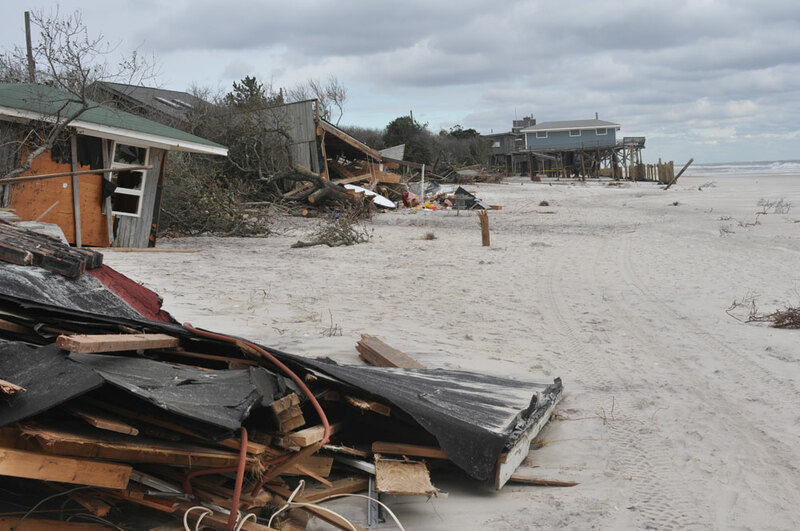 As Hurricane Sandy moved northward along the U.S. Atlantic coast in October 2012, U.S. Geological Survey scientists worked to determine where and how the storm's waves and surge might dramatically reshape the beaches and dunes that stand between the storm and coastal developments. Through a complex modeling process that uses coastal elevations, wave forecasts, and potential storm surge, they predicted coastal change hazards, such as shoreline and dune erosion, that might be expected during a Sandy landfall. Dune erosion was very likely for the majority of the sandy beaches along the Maryland and Delaware coasts with widespread overwash also very likely in many areas. Most of the New Jersey coast was very likely to experience extensive beach and dune erosion and many areas were very likely to overwash. Along the south shore of Long Island, New York, the models predicted extensive beach and dune erosion as well as intermittent overwash. Hurricane Sandy, the largest Atlantic hurricane on record, made landfall on October 30, 2012, and impacted a long swath of the Mid-Atlantic coastline. 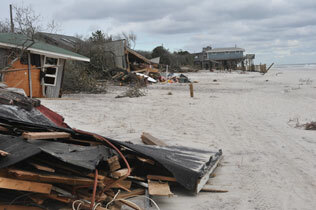 Many areas that had been hit by Hurricane Irene in August 2011 were again battered by strong waves and surge. The barrier islands were breached in a number of places and erosion of the beach and dunes occurred all along the Mid-Atlantic coast. This was the most destructive storm to impact this coastline since an extremely powerful nor'easter in December of 1992. 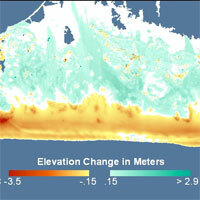 Following landfall, oblique aerial photography and lidar surveys of beach elevations were used to document the changes that occurred as a result of the storm. In addition, field measurements of the beaches and dunes were collected immediately after the storm. Comparisons of data collected before the storm show the nature, magnitude and spatial variability of the coastal response. These data will be used to further refine predictive models for storm-induced erosion.